THIS GUIDANCE IS FOR EDUCATIONAL PURPOSES ONLY. EACH LEGAL SITUATION IS UNIQUE AND THIS INFORMATION MAY NOT BE APPROPRIATE FOR YOUR ORGANIZATION'S SITUATION. THE INFORMATION BELOW IS MERELY A GUIDE AND IS NOT A SUBSTITUTE FOR LEGAL ADVICE FROM AN ATTORNEY. 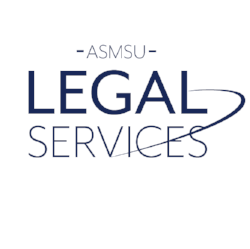 FOR ACTUAL LEGAL ADVICE, CONTACT ASMSU LEGAL SERVICES. Each student organization needs specific organizing documents and must comply with yearly filing requirements. Filing requirements vary depending on the type of organization and the amount of money it brings in each year. Use this FAQ to determine which requirements apply to your specific student organization. Note that all IRS forms referenced below can be found on the IRS website. Does my Registered Student Organization (RSO) have to pay taxes? Do I need to ensure my RSO has been recognized as a tax-exempt organization by the IRS and Montana Department of Revenue? Which type of organization is my RSO? What are gross receipts, and how do I calculate them? How does my RSO calculate gross receipts if they vary from year to year? My organization utilized the MSU Foundation to secure donations. Do we need to claim that money as gross receipts, or income? It appears my RSO needs to file for tax-exempt recognition with the IRS. How do I do that? 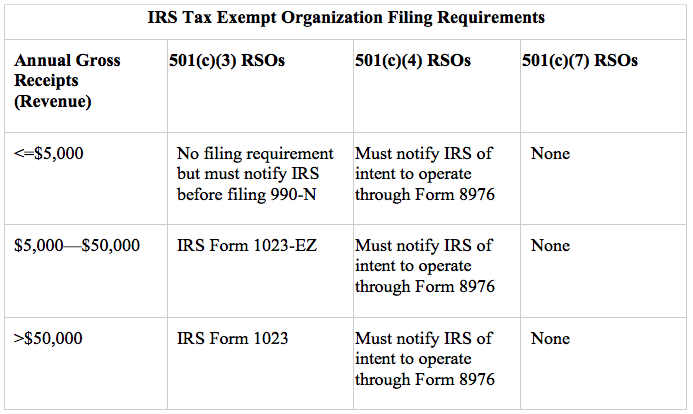 My RSO is a 501(c)(4) or a 501(c)(7) organization — what are my filing requirements? Should my RSO file for tax-exempt recognition even if we’re not required to? 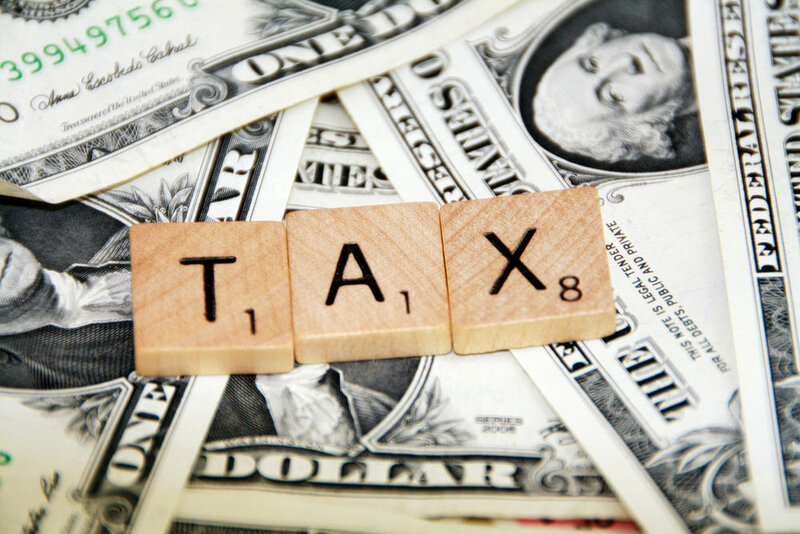 What are my RSO’s yearly tax filing requirements? How do I know which form my RSO needs to file? My RSO needs to have “necessary organizing documents” to be recognized as a tax-exempt organization — what are “necessary organizing documents”? How do I file a Form 990N, the e-Postcard? My RSO has used an EIN for a number of years, but we never filed a Form 990-N or any other Form 990 with the IRS — are we still tax-exempt? Are there limitations on what my RSO can do in order to maintain its tax-exempt status? What are tax-deductible contributions? Are donors able to make tax-deductible contributions to my RSO? If so, how does that process work? My organization has a national/regional association affiliation. What should we do? What is our "tax year"? Does my student organization need to provide any tax documents to other parties? What should I do if I am having issues with any of the forms or have questions? All RSOs at MSU must exist for nonprofit purposes. Therefore, all RSOs at MSU qualify for tax-exempt recognition from the IRS and the Montana Department of Revenue. A tax-exempt organization is one that is not subject to tax at the federal or state levels. Before an RSO may consider itself tax-exempt, however, it must meet certain requirements at both the state and federal levels. All RSOs that are not tax-exempt through a central organization and have an EIN must ensure they have been properly recognized by both the IRS and the Montana Department of Revenue as tax-exempt organizations. Is your RSO part of a broader national or central organization? If your organization is a subordinate controlled by a central organization (for example, a religious group, a veterans' organization, or a fraternity or sorority), you should check with the central organization to see if it has been issued a group exemption letter that covers your organization. If it has, your group has been recognized as tax-exempt, and you do not need to seek separate tax-exempt recognition from the IRS. Does your RSO have an Employer Identification Number? An Employer Identification Number (your tax ID, or your “EIN”) is required for opening a bank account, receiving funding from the Office of Student Engagement, and for a variety of other purposes. If your organization does not manage funds of any kind and you do not have an EIN, you do not need to file anything with the IRS or the Montana Department of Revenue. If your organization is not part of a central organization and you have (or need) an EIN, you may need to file for tax-exempt recognition with the IRS and Montana Department of Revenue. Whether you need to file anything depends on your organization’s mission, purpose, and its yearly gross receipts or revenue. Section 501(c) of the Internal Revenue Code lists the types of organizations recognized by the IRS as tax-exempt. The vast majority of RSOs will be categorized as 501(c)(3), 501(c)(4), or 501(c)(7) organizations. 501(c)(3) RSOs are organized and operated exclusively for religious, charitable, scientific, testing for public safety, literary, or educational purposes. 501(c)(4) RSOs are organized primarily to further the common good and general welfare of the people of the community (such as by bringing about civic betterment and social improvements). This category comprises political groups, special interest lobbying groups, and other certain social welfare and cultural groups that don’t fit into the 501(c)(3) category. Finally, 501(c)(7) RSOs are organized for pleasure, recreation, and other nonprofit purposes. Most club sports, recreational clubs, fraternities and sororities, and other similar groups will be categorized as 501(c)(7) organizations. 501(c)(3):If you determine that your RSO is best categorized as a 501(c)(3) organization, then your next step depends on the yearly “gross receipts” or revenue your RSO receives. If your organization’s yearly gross receipts are less than or equal to $5,000, you do not need to file for tax-exempt recognition with the IRS (but there are still certain yearly filing requirements). If your organization’s yearly gross receipts are greater than $5,000, or if you plan on your organization growing to such a size, then you must file for tax-exempt recognition with the IRS. 501(c)(4): If you determine that your RSO is best categorized as a 501(c)(4) organization, your organization must notify the IRS of its intent to operate as one (this is explained later). You do not need to file for tax-exempt recognition otherwise, but you still have yearly filing requirements as discussed later in this FAQ. If your organization takes in more than $50,000 per year in revenue, ASMSU Legal Services and the OSE may still recommend filing for tax exempt recognition. Contact them with any questions. 501(c)(7): If you determine that your RSO is best categorized as a 501(c)(7) organization, you do not need to file for tax-exempt recognition through the IRS, but you still have yearly filing requirements as discussed later in this FAQ. If your organization takes in more than $50,000 per year in revenue, ASMSU Legal Services and the OSE may still recommend filing for tax exempt recognition. Contact them with any questions. If your organization doesn’t fit any of these three types, contact ASMSU Legal Services before proceeding. For the Montana Department of Revenue, you need to file for tax-exempt recognition if you are otherwise required to do so by the IRS. If you need help with your tax-exempt filings or have questions about this requirement, contact ASMSU Legal Services. A “gross receipt” is defined by the IRS as “the total amounts the organization received from all sources during its annual accounting period.” This number is calculated before subtracting any costs or expenses. Note that this number includes money given to your club through the student organization fee (the amount, if any, you were allocated by the Office of Student Engagement), money given to your organization from an MSU department, donations later re-donated to a charity, dues collected from members, etc. Thus, most forms of money taken in by the organization count against this $5,000 limit. If you do not know how much you were allocated, email clubs@montana.edu and OSE will provide you with this information. In the case of an organization which has been in existence for at least three taxable years, the aggregate gross receipts received by the organization during the immediately preceding two taxable years plus the current year are $15,000 or less. If you have questions about accurately calculating your RSO’s gross receipts, contact ASMSU Legal Services. No, unless the MSU Foundation distributed part of the donation directly to your RSO. For example, if donors have set up an endowment with the MSU Foundation in your RSO’s name, the endowment itself is not includible in your gross receipts. However, if your RSO receives disbursements from the MSU Foundation based on the interest accrued on the endowment, those disbursements are includible in your RSO’s gross receipts, or its income. The rule of thumb here is that any time funds are transferred directly to your organization, from whatever source, you need to include those amounts in your gross receipts. Again, this depends on your organization type and yearly gross receipts. If your organization is a 501(c)(3) organization and your gross receipts are less than or equal to $5,000, you do not have to file for tax-exempt recognition from the IRS (see above for more information). You must still notify the IRS that you are utilizing this exception, however, when filing your yearly tax return (see below for more information). If your organization is a 501(c)(3) organization and your gross receipts are between $5,000 and $50,000 you must file IRS Form 1023-EZ with the IRS and receive formal tax-exempt recognition. You should also file this form if your RSO has less than $5,000 in gross receipts but you plan on having your RSO’s gross receipts grow beyond that point within the next few years. This form has a one-time fee of $275, but once you are tax-exempt you will not have to pay this fee again. It takes 90 days to process. If you wish to do this, we recommend working with ASMSU Legal Services to file. If your organization is a 501(c)(3) organization with yearly gross receipts of greater than $50,000, you must file IRS Form 1023 to receive tax-exempt recognition from the IRS. If you wish to do this, we recommend working with ASMSU Legal Services to file. If your organization is a 501(c)(4) organization your organization must notify the IRS of its intent to operate as one by filing IRS Form 8976. You do not need to file for tax-exempt recognition otherwise, but you may apply for tax-exempt recognition with Form 1024-A. If your organization is a 501(c)(7) organization you do not need to file for tax-exempt recognition, but you may apply for tax-exempt recognition with Form 1024. A 501(c)(4) organization must notify the IRS of its intent to operate as one through IRS Form 8976. Form 8976 is due within 60 days of your organization’s formation. You do not need to file for tax-exempt recognition with the IRS, but you must still meet yearly filing requirements as discussed later in this FAQ. A 501(c)(7) organization does not need to file for tax-exempt recognition. You must, however, still meet yearly filing requirements as discussed later in this FAQ. Even if your RSO is not required to file for tax-exempt recognition, doing so may still be beneficial to your RSO. For example, many prospective donors ask to view some type of letter sent by the IRS confirming your RSO’s tax-exempt status before donating. In such a case, your RSO would fill out IRS Form 1024-A (for 501(c)(4) organizations) or IRS Form 1024 (for 501(c)(7) organizations). If you would like to file either of these forms, we recommend speaking to ASMSU Legal Services. Unless your RSO is part of a central organization or you don’t have or need an EIN, you must make yearly filings with the IRS. These returns are due on the 15th day of the 5th month following the student organization’s tax year. For example, if an organization’s tax year ends in December, the return is due on May 15th the following year. If an organization’s tax year ends in July, the return is due December 15th of that same year. Note that the return does not require your organization to pay taxes—instead, it exists to ensure the IRS that your organization meets the requirements for tax exemption. Which form to file depends on your RSO’s annual gross receipts. RSOs that have gross receipts of less than $50,000, need only to file IRS Form 990-N on an annual basis. See the instructions for completing Form 990-N on the following page. RSOs with gross receipts between $50,000 and $200,000 need to file IRS Form 990-EZ on an annual basis. RSOs with gross receipts greater than $200,000 must file IRS Form 990 on an annual basis. The signatures of at least two individuals. Your intent to form an organization. The following templates are a helpful starting point for organizations looking to draft appropriate articles of organization. Click here for the templates for 501(c)(3), 501(c)(4), and 501(c)(7) organizations. If your RSO is incorporated under the State of Montana as a nonprofit corporation, and your organizing document shows certification of filing, then you have a “necessary organizing document.” This means your organizing document shows evidence that on a specific date it was filed with and approved by the Montana Secretary of State. RSOs that wish to incorporate should speak with ASMSU Legal Services before doing so. Click here to to the IRS WEBSITE. Add EIN (aka Tax ID number) IMPORTANT: If it does not recognize your EIN or states it is inactive, contact the IRS directly at 877-829-5500. If they are unable to help you, please contact ASMSU Legal Services. If your organization was required to ensure it was tax-exempt but never filed Form 990 returns with the IRS for three or more consecutive years, then most likely the IRS does not currently recognize your organization as tax-exempt. You should contact IRS Exempt Organizations (877-829-5500) to find out exactly what your RSO’s status is. Note: This situation applies even if your RSO was not required to file for tax-exempt recognition (i.e. 501(c)(3) with under $5K in annual gross receipts or a 501(c)(7)). If the IRS was previously tracking your RSO as a tax-exempt organization, but you didn't file your Form 990 returns for three or more consecutive years, then most likely, you will have to apply (or reapply) for tax-exempt recognition using the proper form. Note: This situation applies even if your RSO was not required to file for tax-exempt recognition in the first place (i.e. 501(c)(3) with under $5K in annual gross receipts or a 501(c)(7)). The IRS will no longer assume your RSO is a tax-exempt organization and you must now file for tax-exempt recognition regardless of your gross receipts. If, after calling the IRS, you are unable to file your Form 990, contact ASMSU Legal Services. There are three primary limitations. No part of your RSO’s funds may be used to benefit private individuals. This is already a requirement for becoming an RSO through MSU. RSOs must spend their income exclusively on activities that further their exempt purpose. For example, 501(c)(3) RSOs must spend their income exclusively to further the charitable purpose for which they were formed, 501(c)(4) RSOs must spend their income exclusively to further the common good and general welfare of the people of the community, and 501(c)(7) groups must spend their income exclusively to further the social and recreational causes for which they were formed. 501(c)(3) and 501(c)(7) RSOs may not, as a substantial part of their activities, attempt to influence legislation or participate to any extent in a political campaign for or against any candidate for public office. * Certain voter education activities or public forums conducted in a nonpartisan manner may not be prohibited political activities, but these are very limited. Some RSOs may engage in very limited lobbying activities, but speak with ASMSU Legal Services before engaging in any of these activities. If you have questions about these limitations, we recommend contacting ASMSU Legal Services. *Note: 501(c)(4) RSOs may lobby for legislation germane to the organization's purpose, and they may, in very limited and special circumstances, directly or indirectly attempt to influence political campaigns. If your 501(c)(4) organization is looking to become involved in a political campaign, it may do so as long as that is not its primary activity. However, any expenditure it makes for political activities may be subject to taxes. For further information regarding political and lobbying activities of section 501(c)(4) organizations, see the IRS’s website or speak with ASMSU Legal Services. Only 501(c)(3) organizations may receive tax-deductible contributions from donors. A tax-deductible contribution is an amount donated to your club that a donor can deduct on their tax return. Note: If a donor wants to give your RSO $250 or more as tax-deductible charitable contributions, they must get a written receipt from the 501(c)(3) RSO for the contribution before they may do so (See below for more details). Other organizations may still receive donor contributions, but the donors may not deduct those contributions from their taxable income. When these other organizations solicit contributions, they must include a statement that payments aren't deductible as charitable contributions for federal income tax purposes. The statement must be included in the fundraising solicitation and be conspicuous and easily recognizable. For more information on soliciting and accepting donations as a 501(c)(3) organization, and for a number of examples to help you understand the rules, see IRS Publication 1771, found here. Consult with your association for guidance on what your club is responsible for filing, if anything. As stated above, your national or central organization may have received a Group Determination Letter from the IRS, meaning your RSO is not obligated to file for tax-exempt recognition or to file annual returns. Each student organization can set their own. We generally recommend you use the calendar year (Jan. 1-Dec. 31). In rare cases the MSU fiscal year (July-June 30th) might be appropriate. If your RSO paid an individual or unincorporated business more than $600 in your RSO's tax year, your club must complete a 1099-MISC reporting form. To do so, add up all payments made to a payee during the tax year, and if the amount is $600 or more for the year, you must issue a 1099 to that payee. This is ONLY if you made the payment from your student organization bank account directly. If you turned in any invoices to be paid directly to the vendor from the Office of Student Engagement, you DO NOT need to submit this form. All MSU RSOs are nonprofit organizations, so they should only owe taxes in extremely limited situations. However, there are fees associated with certain filings. Here is a breakdown of the costs for legal services and most IRS filings (fee payments for forms are often made by attaching Form 8718 with the appropriate “user fee”). If you have general questions, need clarification, or have questions about your student organization fee funding, please contact the Office of Student Engagement at 994-3113 or email Mandy St. Aubyn at: amanda.staubyn@montana.edu. If you are having issues with the tax forms or have specific questions about the IRS requirements, please contact the IRS Tax Exempt/Government Entities Help Line at 877-829-5500. Please note that faculty or staff advisors are often not able to retrieve information on their own as they are generally not appointed officers in the group. If you need legal advice or are having issues receiving a solution from the IRS, your student organization is welcome to schedule an appointment with ASMSU Legal Services. As a registered student organization, ASMSU is waiving this fee. If you miss your appt., however, you will be charged $10. The individual(s) who will be filing the IRS documents must be at the meeting. Be sure to indicate when you make the appt. you are with a student organization. Be prepared to bring any relevant documents to this appointment, such as IRS letters, financial records and your Tax ID number. Please only have those with the authority to make decisions for your student organization attend this meeting.